Glossybox is a monthly beauty subscription service that features five luxury beauty products for $21 and free shipping. There are 3, 6, and 12 month options that will each lower the monthly price by either a couple or several dollars. The boxes include many lesser known brands and some well-known brands that we all love like Tarte, Benefit, Burberry, and Essie. Let's get right into what we got this month! I'd never tried a shower foam, but they always sounded kind of fun to me! This is a gel-to-foam body wash that smells just like fall with notes of cedar and citrus. The scent is really strong and lingers in my bathroom for a while which is nice. And the foam is really cool and was a nice break from my usual shower gels. This is a wonderfully soft but firm eyeshadow brush which will be perfect to pack color onto the lids. You can tell that this is a great quality brush just by holding it as it has a bit of weight to it. This is a milk and oat based cleansing powder that exfoliates the skin leaving it soft while lessening hyper-pigmentation. You mix the powder with water and apply it to your face, let it dry a bit, and then massage/wash it away. I tried this once and it smells slightly of oatmeal which is cool and different. It did a great job at exfoliating my skin and my face definitely felt really soft after. I think this was an extra item because it wasn't listed in the box insert. This is a really pretty floral scented perfume that for some reason reminds me of my childhood. This is a cream, stick blush. It's a beautiful soft pink. I prefer powder blushes so I'll be passing this along. This is a shiny and opaque lip gloss in a beautiful bright pink. I no longer wear these types of shades so I'll be passing this along to someone who will appreciate this gorgeous color. 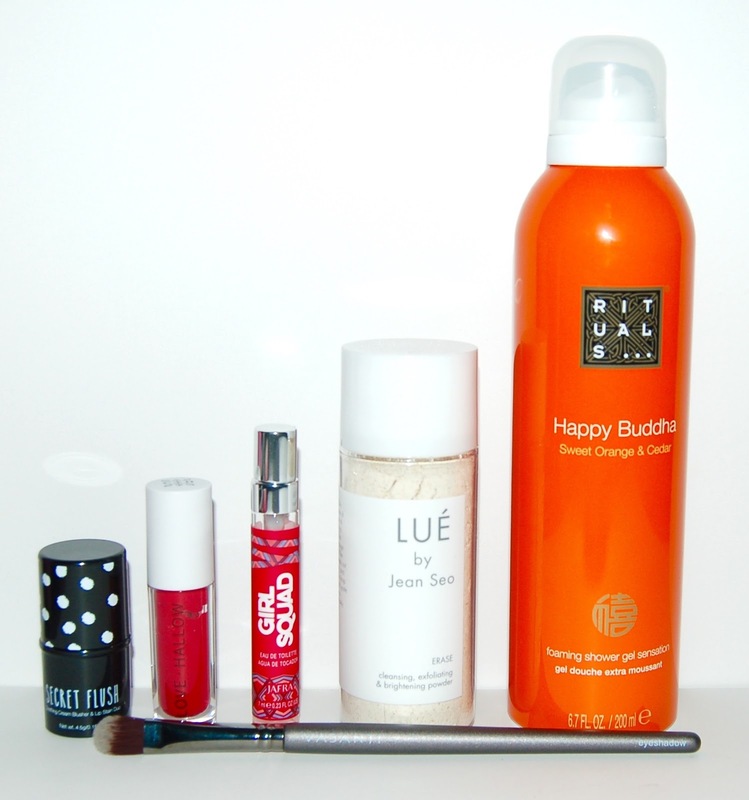 Overall, I though the October Glossybox was ok. I really like the shower gel, the eyeshadow brush, and the facial exfoliator. The total value of the items in this month's box is about $86 which is over 4 times the cost of the box, so that's a great value! or any of the products in this month's box?